Issues faced by the City of Kerrville, Kerr County, and surrounding communities. An article appearing in this week’s Hill Country Community Journal attributes two statements to Baroody’s attorney following the latest city council meeting. During that meeting, Baroody’s attorney, Roger Gordon, spoke on behalf of Mr. Baroody and requested that council restore Baroody to the discussions regarding the Peer Recovery federal lawsuit that’s been filed against the city. Council denied that request. So although no lawsuit has been filed and Baroody has stated that he does not intend to sue the city, his attorney can make no assurances that a lawsuit will not happen. With early voting only a few days away, we will continue to follow this story. In addition to the recap of the latest meeting, the Journal has compiled a timeline of all events leading up to the latest council meeting. Please read their article via the link below. This entry was posted in City of Kerrville, Local Issues, News and tagged baroody, city council, lawsuit on April 17, 2019 by Aaron Yates. A large audience attended Tuesday night’s meeting, which was one of the most informative meetings in recent memory (in this author’s opinion). The information presented was interesting and valuable, but the audience also received a bit of a civics education along the way. Because of the major issues handled during this meeting that relate to at least one candidate up for election, we believe this meeting should be required viewing prior to the citywide election. Enjoy the entire meeting at this link, or see the embedded video below. Unedited, full meeting footage from April 9, 2019. Two items were of particular interest in last night’s meeting: Baroody sanction relief request, and Baroody’s debt presentation. Let’s discuss each of those in more depth. As readers will remember, in November 2018, Baroody was removed as Mayor Pro Tem and was barred from discussions about a federal lawsuit that the city is defending. Baroody went against legal advice and made contact with the opposing legal counsel. On Tuesday night, Baroody and his attorney presented a request to reinstate him to those lawsuit discussions. Several times, Baroody insisted that he has no plans to file a lawsuit against the city, and that his attorney is only helping him understand what’s happened and what his options are going forward. According to Baroody, he “never meant to do harm,” to the city, and looking back he, “would have done things differently.” However, Baroody offered no apology for his actions. Six members of the audience spoke against the request to reinstate Baroody, and none spoke in favor of, or in defense of, Baroody. All of the council members gave their views, as well. Following the discussion, Mayor Blackburn asked for a motion, but no motion was made. Council went on to the next agenda item. The next agenda item was also requested by Councilmember Baroody. 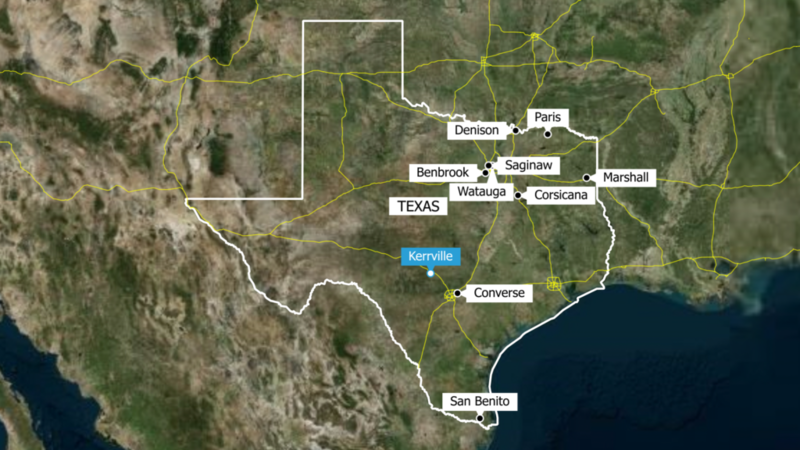 He presented graphs and information that was nearly identical to the political advertisement that appeared in last weekend’s Kerrville Daily Times, that we dealt with previously in this article. The graphics compared 16 Texas cities that are similar in population and have a “AA” bond rating from Standard & Poor’s. 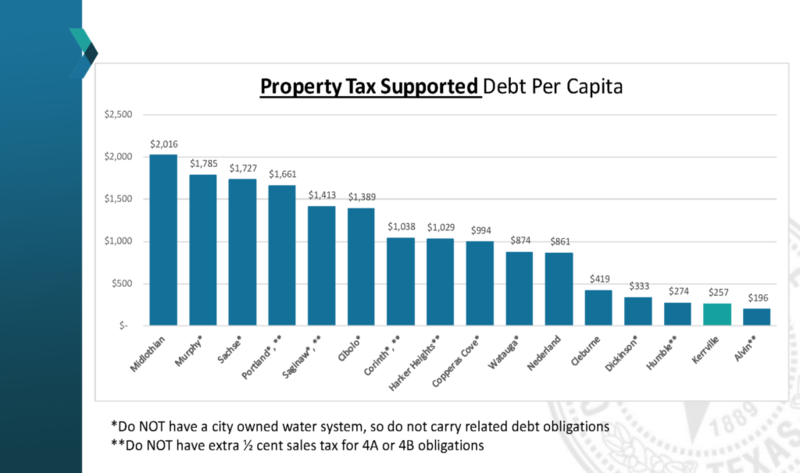 Baroody took exception to the graph that was presented to council in March which showed the amount of tax-supported per capita debt for these 16 cities. Baroody displayed his own graphics next that showed the total debt, total per capita debt, and total debt to personal income ratio. 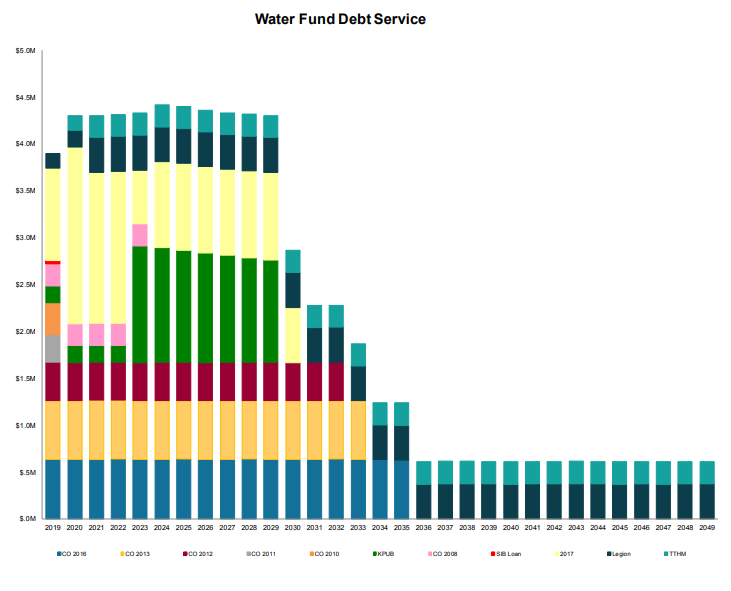 Unfortunately we do not have these graphs to show here in a better format because Mr. Baroody only made them available to the city staff and to the other council members on Tuesday afternoon. However, the charts are very similar to the political ad we linked above. Screenshot of one of Baroody’s graphs that he presented on Tuesday night. Mr. Baroody stated several times that he is not passing judgment on the debt, and he does not think the city is in dire financial straits. In fact, he stated that the city is in a strong financial position. He claimed he only brought this up so that the community is better informed about the entire debt picture. Following Mr. Baroody’s presentation, the community became much more well-informed about all aspects of the debt thanks to a presentation by Director of Finance Amy Dozier. 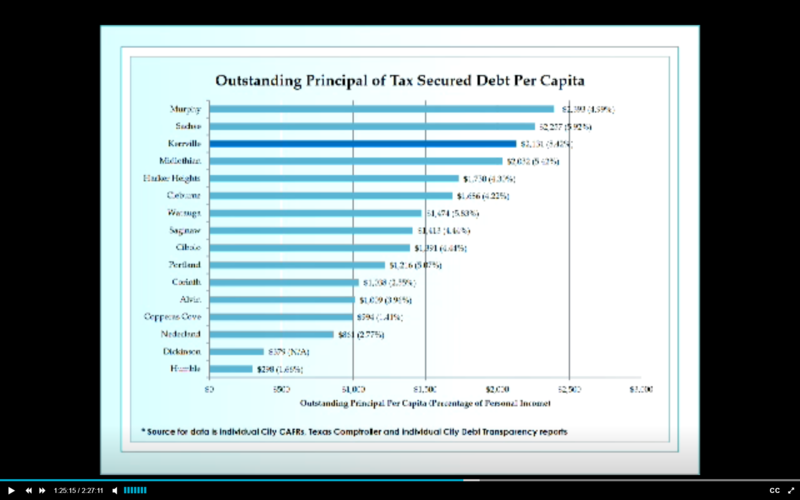 Mrs. Dozier presented and discussed numerous slides to paint a fuller picture of the city’s debt as compared to these other Texas cities. Mrs. Dozier’s presentation is difficult to sum up in a short article, so we strongly urge our readers to watch both Mr. Baroody’s and Mrs. Doziers presentations via the embeeded video below. 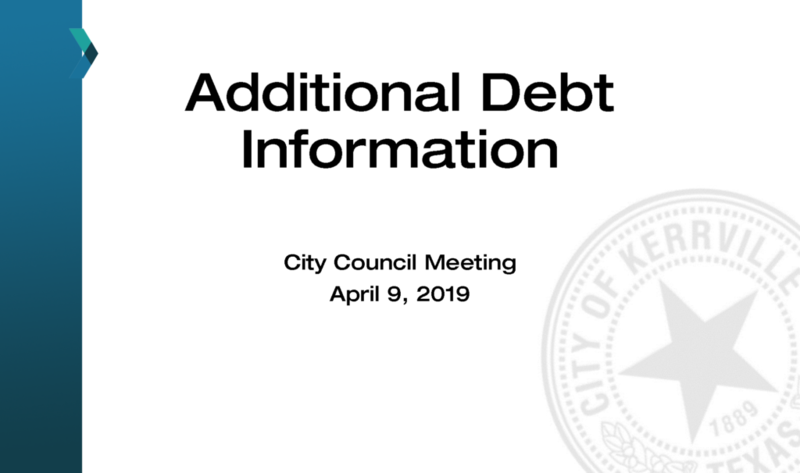 The takeaway from Mrs. Dozier is this: The city does indeed have debt — around $60 million worth. 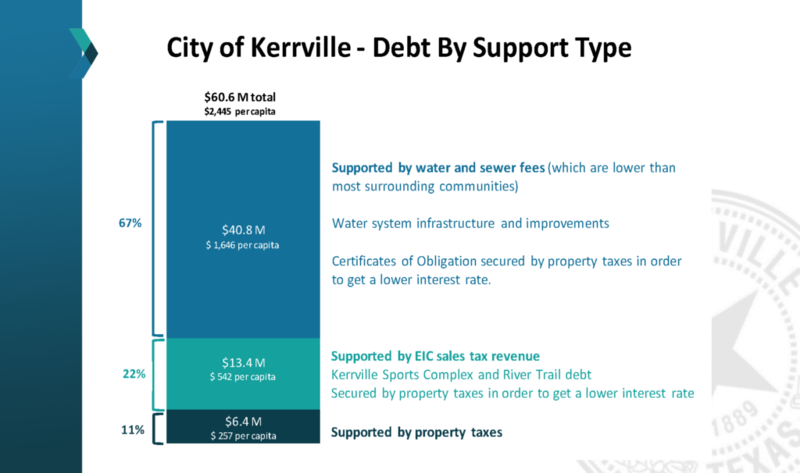 But the City of Kerrville is somewhat unique in that very little of this debt is property tax-supported. 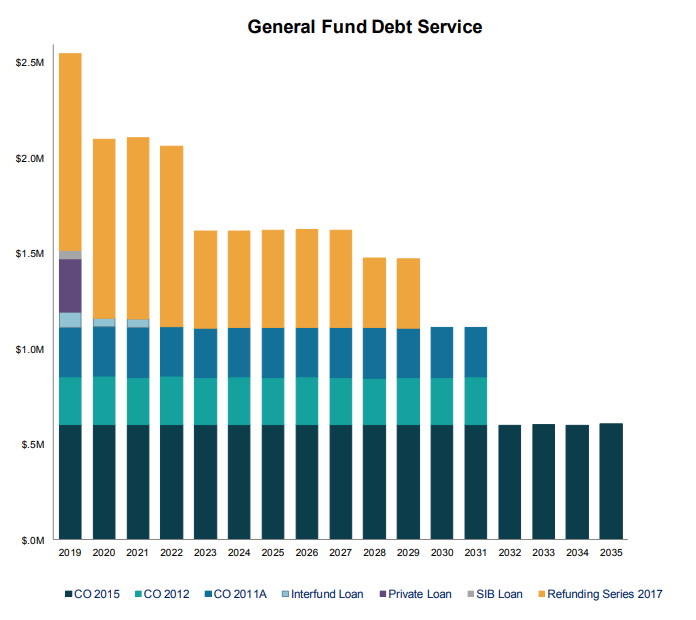 The vast majority of our debt is supported by other revenue sources such as 4B sales tax revenue, utility revenues, etc. She cautioned everyone to be clear on the difference between “tax-supported debt” and “tax-secured debt.” See the video below for more information. Public speakers that followed Mrs. Dozier, including former Mayor Jack Pratt, accused Baroody of political grandstanding ahead of the election. Former city councilperson Mary Ellen Summerlin questioned why Baroody was bringing this up now, just weeks before the election, instead of during the nearly two years that he’s served on council. At the end of the lengthy discussions, no action was taken, and council moved on to the next agenda items. No action was taken as a result of either agenda item that Mr. Baroody requested. These two items dominated the majority of the meeting duration and numerous community members rose to speak out against Mr. Baroody’s actions and claims (and none rose to support him). Staff spent time preparing a response to Mr. Baroody’s claims and did a fantastic job of presenting a complicated subject in an easy-to-understand manner. Tuesday’s meeting was the last one before early voting begins. The next meeting is scheduled for April 23, and early voting begins on April 22. Election Day is Saturday, May 4. All citizens residing in the city and eligible to vote are able to cast a ballot in this year’s citywide election. “Council upholds Baroody lawsuit ban.” Kerrville Daily Times. April 10, 2019. 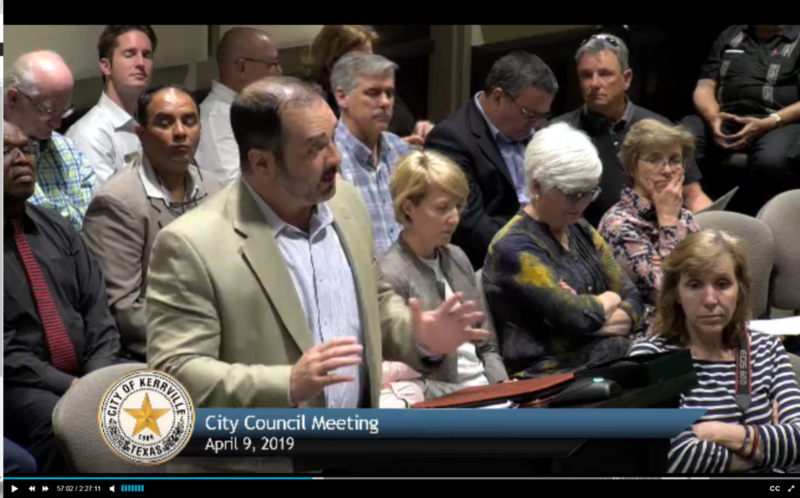 “City Council Meeting 04-09-19.” Video found on City of Kerrville website on April 20, 2019. 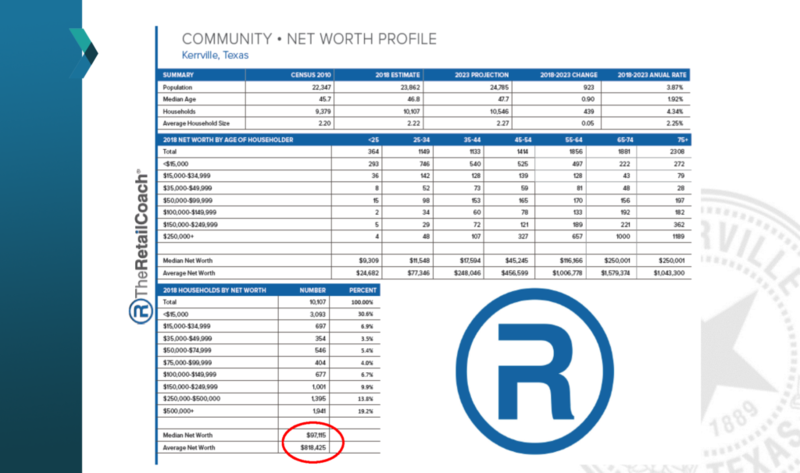 This entry was posted in City of Kerrville, Local Issues, News and tagged baroody, city council, debt, finance, lawsuit, meeting on April 10, 2019 by Aaron Yates. Discussion, review and possible action regarding the City Council decision to constructively remove councilmember George Baroody from office at the special meeting called on November 8, 2018. Requested by and presented by Councilmember Baroody and Attorney Roger Gordon. Presentation clarifying status of City of Kerrville debt supported by ad valorem taxes. Requested by and presented by Councilmember Baroody. These two items could be characterized as a politicization of one of the last two council meetings held before early voting begins on April 22. Each of these politically-charged issues have been front-and-center in the campaign for city council. George Baroody has served as City Councilmember Place 2 since May 2017. He claimed that chair after running unopposed in the 2017 election (having been defeated in contested elections each of the two prior years). His first term expires this year, and he’s seeking election to Place 1, facing off against local real estate businessman Gary Cochrane. The election will be held on May 4, following early voting between April 22-30. Potential Baroody vs. City of Kerrville Lawsuit? During the campaign, Baroody hired attorney Roger Gordon, the same attorney that represented Bonnie White in some of her previous legal dealings with the City of Kerrville. Gordon delivered a letter to city attorney Mike Hayes that was perceived as a threat of legal action against the city following Mr. Baroody’s sanctioning that was imposed by council in November 2018. What led to Baroody’s sanctions? Disregarding the advice of counsel, Mr. Baroody approached the plaintiff’s attorney in a lawsuit brought against the city by a sober living home. Against legal advice, Mr. Baroody attempted to make contact with the opposing counsel, and was subsequently barred from all future deliberations about the suit, and was also stripped of his “Mayor Pro Tem” title. Baroody’s attorney sent a letter to City Attorney Mike Hayes asking questions about the removal and the events surrounding that November 2018 action. That letter was widely seen as a not-so-veiled threat of a lawsuit against the city and/or the council. Can (or will) the city or the council even discuss this matter in open session since it may result in a future lawsuit brought by Mr. Baroody against the city? What new information will be presented that hasn’t already been discussed at length in the November meeting or subsequent meetings? What new action will be taken? Will Baroody’s attorney expressly or implicitly threaten legal action once again? Will the attorney request any action by the council or by staff? Will the discussion be useful, or will the topic be used as a political soapbox less than two weeks prior to early voting? 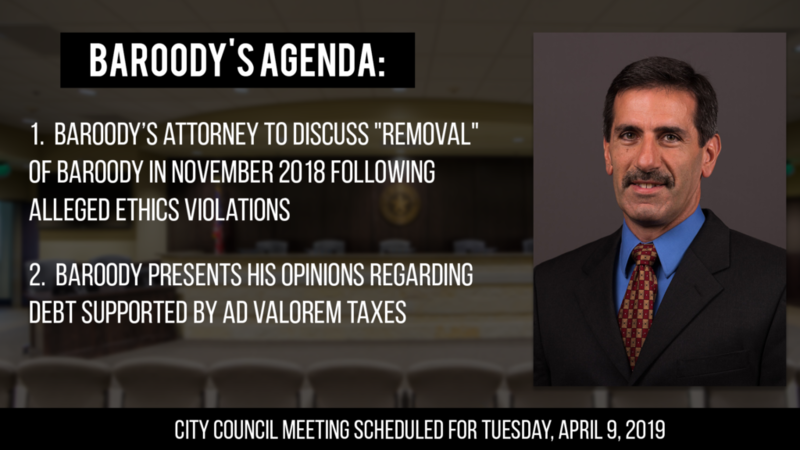 Although it’s not clear exactly what the second agenda item will entail specifically, we predict that Baroody will use this topic to address claims and counter-claims regarding the city’s debt position and how it relates to ad valorem property taxes. As you’ve read on this site in recent days, Baroody’s running-mate Mario Garcia published a misleading advertisement in the Kerrville Daily Times on Saturday, March 30, in which he implied that Kerrville’s financial situation is dire and that debt levels have risen to dangerous levels. We debunked many of those claims in our most recent posting, and we will have more information coming in the very near future (stay tuned). Is this presentation simply a political opportunity to campaign from the council dais, or do you have relevant new information that the public has not already seen? The timing might look suspicious, given that the meeting takes place less than two weeks prior to early voting. Is there a reason you’ve chosen to address this topic now, nearly two years into your first term in office, and not sooner? What resources have you used to prepare this presentation? 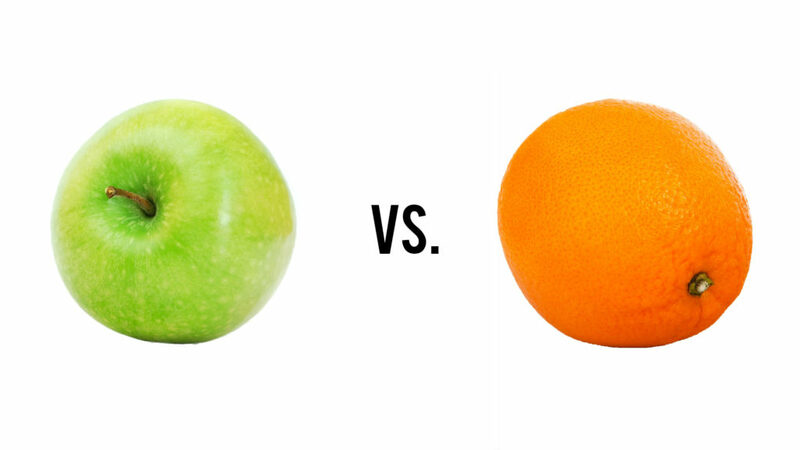 Have you relied upon staff, outside experts, or have you come to your conclusions on your own? 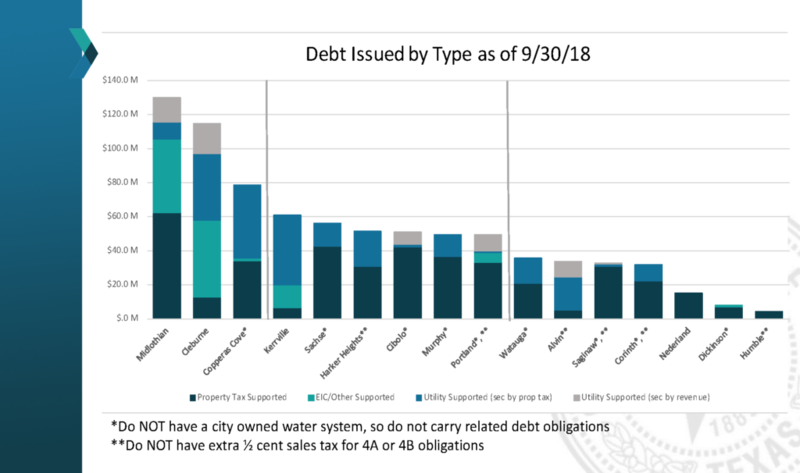 According to our tally, Mr. Baroody has voted to increase the city’s debt by about $30 million during his term in office. Will you now disavow those previous votes as you attempt to make the city’s financial position (a financial position that you helped create and shape) a central element of your campaign? 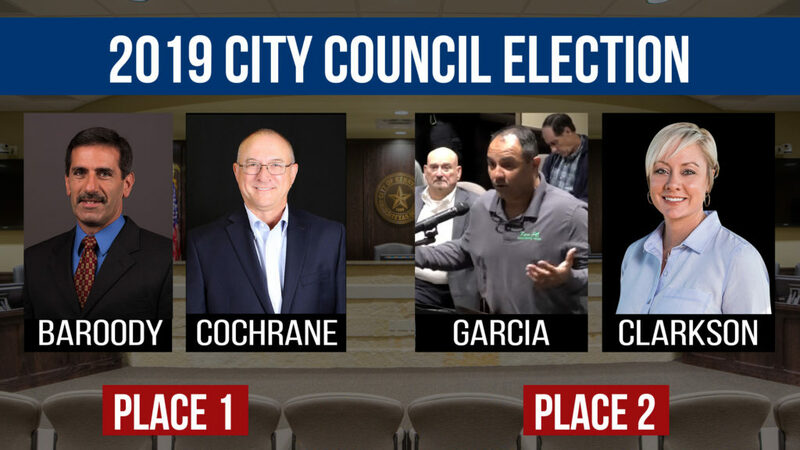 Baroody is at risk of appearing to politicize the city council meeting held less than two weeks before early voting begins, as voters will decide whether to continue with Baroody or elect Cochrane. By bringing his attorney to participate in the discussion, Mr. Baroody once again makes moves that can be construed as an implicit legal threat against the city he is campaigning to lead. 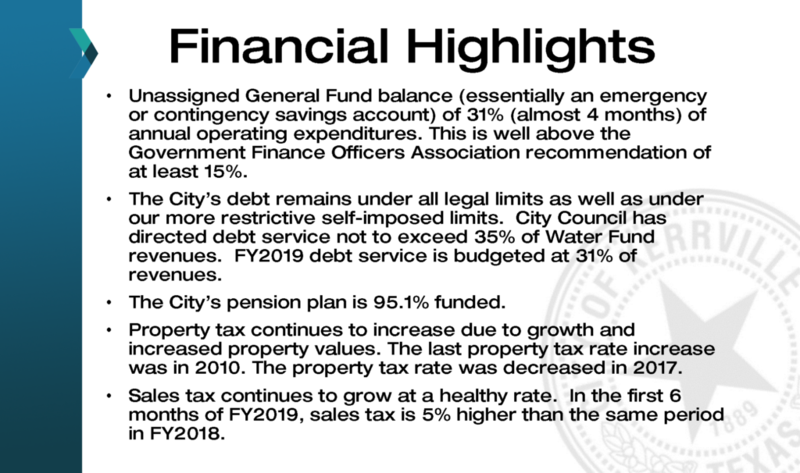 Lecturing the council, staff, and public about the debt positions and tax implications of the city’s complicated financial situation seems to be on-par with Baroody’s tendency to lead by looking backward instead of forward. This type of presentation adds to the perception that Mr. Baroody considers himself to be “the smartest man in the room” at all times. 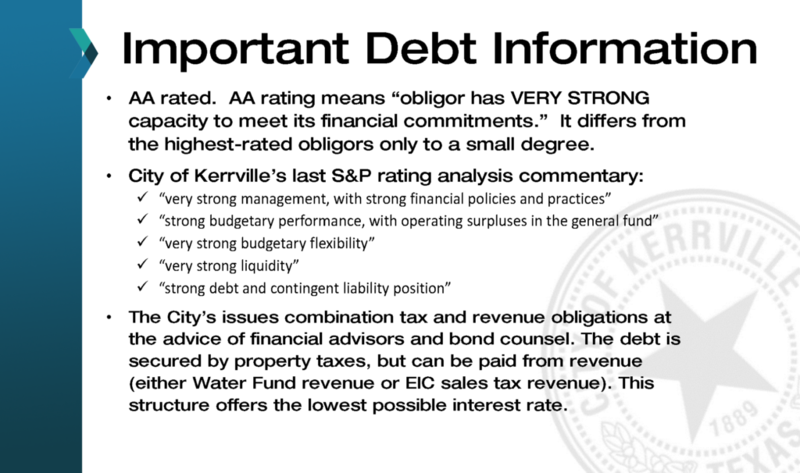 Regardless of Baroody’s conclusions on debt, Standard & Poor’s continues to rate the City of Kerrville with an “AA” rating, giving the city high marks for a strong financial and credit position. And, notably, the city has not raised taxes in over nine years while continuing to pursue valuable investments in infrastructure, quality of life, and economic development. This entry was posted in City of Kerrville, Local Issues, News and tagged agenda, baroody, city council, debt, finance on April 6, 2019 by Aaron Yates. Live blog of this morning’s council workshop. Tempers flared on Tuesday morning during a special meeting of City Council that was scheduled to address concerns raised by Councilmembers Voelkel and Baroody about several topics related to codes, platting, and enforcement. The workshop, which lasted approximately 1 hour and 45 minutes, was held in council chambers and broadcast live on the city’s public video channels. The meeting began with reports from city staff, and was followed by questions and discussion from council members, during which time it quickly devolved into finger-pointing, accusations, and hot tempers on the part of Voelkel and Baroody, and to some degree, on the part of staff members. Mayor Bill Blackburn officiated the meeting, and several times had to interrupt to move discussions forward when they seemed to reach an impasse, such as when Voelkel defended his family surveying business’s platting services and pushed blame onto former City Manager Todd Parton. During that exchange, City Attorney Mike Hayes reminded the council that he has spent several hours on that one issue alone, but he has not been able to make headway with the council members. Blackburn interrupted to move past this point of contention, noting that it’s an issue that has been discussed for months prior, but that likely wouldn’t be resolved today. Voelkel raised several other issues, and repeatedly badgered staff about whether or not City Hall has “access” to Highways 16 and 27. Deputy City Manager EA Hoppe repeatedly stated that yes, City Hall does have access to the two highways. Whether or not TxDOT would permit additional driveways was another matter. Voelkel continued to question staff’s responses. Voelkel also questioned the markings and signage for fire lanes at various properties throughout the city, including at Peterson Plaza, River Trail Cottages, and other unnamed projects. He said he just wanted all parties to be treated equally under the law. When it was Baroody’s turn to ask questions, he initially requested to be skipped saying, “I need to compose myself.” After a short recess, Baroody began a 20-minute discussion (dominated by monologues) in which he accused staff of “making excuses” and not offering solutions. Councilperson Judy Eychner interrupted Baroody during this portion, encouraging him to move on to his questions rather than spend staff’s time on rehashing his numerous complaints. Mayor Blackburn waived Baroody’s time limit and encouraged him to ask all questions he (Baroody) felt were important. One of Baroody’s first questions had to do with the distinction between boarding homes versus apartment complexes. Director of Development Services Drew Paxton explained the rules and the differences, as defined. Baroody continued to fire questions at Paxton and further questioned the staff’s interpretation of the ordinances. Baroody attempted to slam the door shut after he concluded that staff was wrong and he was right. Paxton and Hayes attempted to correct Baroody’s incorrect assertions, but Baroody preferred to move on to other matters rather then listen to their response to his accusations. Baroody went on to berate the city staff for the actions of the Planning and Zoning Commission regarding variances. He accused staff of not doing a good enough job of explaining the laws to the volunteer board members. During this portion of Baroody’s monologue, Eychner and Sigerman interrupted Baroody again to find out if he had any questions for the staff, or if he was just continuing to offer his opinions once again. Baroody moved on to another topic without asking any questions of staff on this matter. Next, Councilmember Baroody moved on to the Chamber of Commerce electronic sign issue. Baroody criticized the Kerrville Daily Times newspaper article and cast aspersions on the city’s report, accusing staff of mis-characterizing the issues regarding the sign. City Manager Mark McDaniel seemed exasperated, stating that he’d already answered these questions many times, but attempted to do so again. Baroody accused McDaniel of being “confused by the words I’m giving you.” Baroody again moved on after seeming to be dissatisfied with the explanation the McDaniel offered. After twenty minutes of “discussion” that consisted mostly of Baroody speaking and refusing to accept the staff’s answers, Mayor Blackburn interrupted and asked for Baroody to conclude his statements if he felt he could feel satisfied in doing so. Baroody stated that he wasn’t pleased to be asked to conclude, but he would “play by your rules.” Baroody chastised staff again for failing to provide leadership within the various departments that he accused of having poor processes. Baroody and Eychner traded barbs as Baroody continued his remarks. At one point, Eychner asked City Manager Mark McDaniel how many staff hours were consumed creating this 40-page report discussed today. McDaniel stated that it took around 150 hours to prepare. Eychner thanked staff, saying that good things would come out of this process despite the pain. She asked again about the staff time and resources dedicated to the preparation of this report. McDaniel estimated that approximately $11,000 in staff labor and 150 hours were consumed to answer Voelkel and Baroody’s accusations. “It’s about truth, and it’s about shining light on what happened. I like that you ask questions. But when you ask over and over and over again, it’s difficult,” McDaniel stated. Judy Eychner offered a three-part motion. The three parts included: 1.) Consultants be asked to expedite review and responses to the sign portion of the codes and bring that back to the code review committee as soon as possible; 2.) Staff be require to provide a report regarding ongoing improvements in the development and permitting processes every two months; 3.) Questions that have been asked and answered today NOT be placed on a future agenda unless done so by the mayor, council majority, or city manager. The motion passed 3-2 with Blackburn, Sigerman, and Eychner in favor, and Voelkel and Baroody opposed. Baroody accused Eychner of trying to “shut down” himself and Voelkel, but Sigerman and Eychner denied that accusation, noting that the motion would only prevent these specific items from coming back up repeatedly unless they needed to be revisited according to others in addition to Baroody and Voelkel, such as the mayor or one other councilperson. This entry was posted in City of Kerrville, Local Issues, News on March 19, 2019 by Aaron Yates. Tuesday’s agenda consists of only one item. Over the course of the past several months, council members Vincent Voelkel and George Baroody have raised concerns about inconsistent enforcement of certain city codes and statutes. Although city staff has answered most of their questions several times before (as noted by City Manager Mark McDaniel, witnessed in several recent public meetings, and backed up by various internal emails provided to Kerrville United), the questions came to a head during the February 26 City Council Meeting. A special workshop was called to address these matters, and that meeting will occur this Tuesday morning, March 19, at 10 AM. In response to Voelkel and Baroody’s often overlapping questions about these matters submitted in two separate emails (found in the appendix of the report), city staff gives detailed answers and reviews of each of the areas of concern. The full report can be viewed as a PDF using the link below. These very public challenges launched by Baroody and Voelkel against staff come in the heat of a contentious political campaign for two city council seats. Baroody is currently serving in Place 2, but is campaigning for Place 1 in the election slated for May 4. Voelkel, who serves in Place 1, is not seeking re-election. Baroody’s opponent for Place 1 is Gary Cochrane, while Kim Clarkson and Mario Garcia (Baroody’s ally) vie for Place 2. Some voters we spoke with worry that much of the discussion on Tuesday will be political grandstanding ahead of the election, but Baroody supporters disagree. In the lengthy report linked above, some of the responses raise questions of their own about the challengers’ actions in dealing with the matters at hand. For instance, on page 5, Voelkel asks questions about the platting and access issues for City Hall property. In response, the author says that Voelkel’s family business, Voelkel Land Surveying, made a platting error that contributed to the confusion on the City Hall land. Then, the author claims, the city negotiated a remedy to the access issues mentioned by Voelkel, but Voelkel’s attempts to widen the negotiations caused the deal to break down. The final resolution is still stalled. The report states that there is room for improvement in some areas, and some corrections and enhancements have already been made. For instance, outdated software is scheduled to be updated or replaced in April. And some problems don’t have an immediate solution. However, staff has already made changes to improve certain processes, according to the report. Tuesday morning’s meeting can be viewed live at the link below beginning at 10 AM that day. Recorded versions should be available on YouTube later in the day. Another meeting is scheduled at 4:00 PM — a joint meeting between City Council and the Planning & Zoning Commission — to discuss code review. This entry was posted in City of Kerrville, Local Issues, News and tagged city council, code enforcement, special meeting on March 18, 2019 by Aaron Yates. The filing deadline passed on Friday for a spot on the May 2019 ballot for City Council Place 1 and Place 2. Following the city’s official press release naming the four candidates in the race, Kerrville United has begun reaching out to invite them to appear on our platform. We cordially invite each candidate to sit for a video interview so that the voters can be better informed about their choices on this year’s ballot. Dates and times will be announced after the candidates have a chance to respond to our invitation. Since 2016, Kerrville United has provided the public with information that is difficult to find in other forms of local media. We focus on local politics — Kerrville city politics, specifically. For the past three years, KU has interviewed candidates, created “explainer” videos, and published scores of articles explaining not only the current news, but also the context, the history, and the explanations to help you understand local news and issues. All of this content is presented free of charge, without paywalls, and is presented on the web and social media so that it’s easily accessed by the entire voting population. 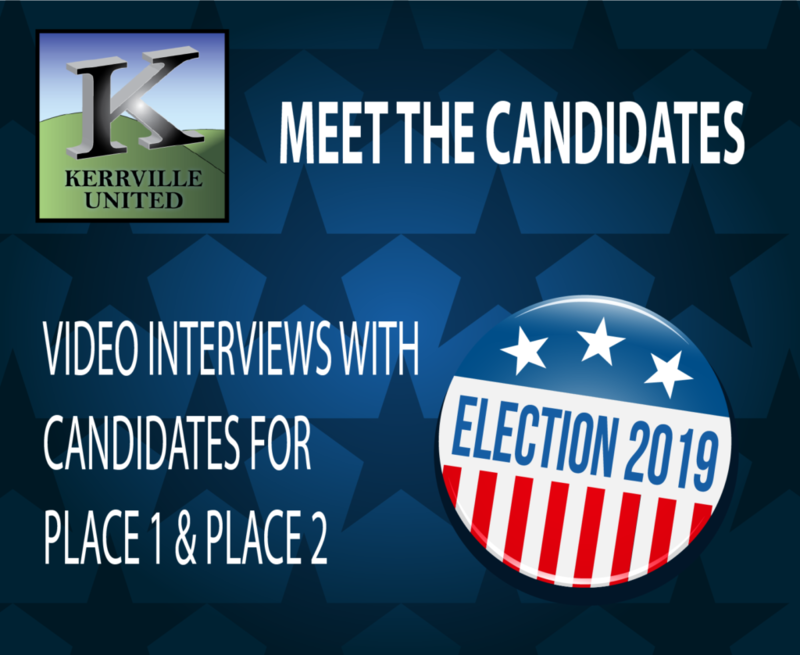 Kerrville United invited candidates from both competitive races to appear for an interview in 2018. During that election cycle, only Bill Blackburn and Judy Eychner agreed to be interviewed. Bonnie White and Gary Cooper did not respond to our invitation. We extended the same invitation in 2017, and only Stephen Fine agreed to participate during that election cycle. Some candidates are nervous about what to expect when sitting for an interview with us. So we have created these public ground rules and stipulations that we pledge to adhere to when producing these candidate interviews. All four candidates are invited to participate in this interview series. The city has publicly announced that all four candidates mentioned above have filed the proper paperwork for a spot on the ballot, so all four are invited. If additional candidates file as a write-in, they will also be invited to participate. The city’s deadline for a write-in candidacy is February 19. This announcement and invitation is being posted on this website and on our public Facebook page. We will also send email invitations to candidates, if we have their contact information. As of this writing, we have contact information for all candidates except Mr. Garcia, and we have begun reaching out to his family members to gather his contacts. All interviews will be broadcast live and unedited on Kerrville United’s streaming platform(s) which may include Facebook, YouTube, and/or another live streaming service. After the live broadcast, the full, unedited interviews will be available for public viewing “on demand” via Facebook and YouTube. Interview location will be determined by Kerrville United producers based on the suitability of a site for lighting, sound, and other production considerations. All interviews will take place in Kerrville. Interview dates and times will be negotiated individually with each participating candidate, and will be publicly announced as soon as a time and date is agreed upon. This invitation to participate expires on Monday, April 1 at 12:01 AM. If a candidate has not agreed to participate by this deadline, we cannot guarantee a spot. Topics, questions, and conversation topics will not be made available to the candidates in advance. However, KU does offer “coaching” to each candidate, which includes instructions and recommendations on how to prepare for an interview of this type, such as: Review and become familiar with issues that our city faces; prepare to share your resume, background, and relevant experience; a reminder live interviews do not have “retakes” or “re-dos,” so we suggest taking one’s time when answering tough questions; what to wear to look your best on film. All questions and topics will be relevant to a candidate’s potential service as a council member. If a candidate has served in city government previously, either in elected office or on a board or commission, questions may include the candidate’s history and record of public service and voting record. We pledge that there will be no “gotcha” questions, which we define as “off-topic, irrelevant, or personal questions that have no bearing on a candidate’s potential service on city council.” During the interview, if a candidate disagrees with the premise of a question, or feels that the question violates this policy, we encourage them to say so, and explain their reasoning. Each interview will be conducted by Aaron Yates, founder of Kerrville United, and will be in a one-on-one format — one interviewer, one interviewee. We pledge to be respectful of each candidate’s valuable time, and we will keep the interviews concise and on-topic, and will not exceed thirty minutes of live broadcast time. If any candidate (or any audience member) has any questions about these proposed interviews, please do not hesitate to contact Aaron Yates via email at aaron [at] kerrvillephoto.com, or by sending us a message on Facebook. We thank the candidates in advance for their consideration of this invitation, as well as for their commitment to public service. This entry was posted in City Council, City of Kerrville, Elections, Kerrville, Local Issues, News and tagged city council, election, interview on February 16, 2019 by Aaron Yates. In a 4-1 vote on Thursday evening, February 7, the Planning and Zoning Commission denied a variance request for a large electronic sign submitted by Calvary Temple Church. The proposed sign was to be located on church property along Loop 534, and would have more than doubled the currently allowed maximum sign area. The motion to deny was made by David Jones, seconded by Garrett Harmon, and passed 4-1, with Chairman Bob Waller casting the dissenting vote. 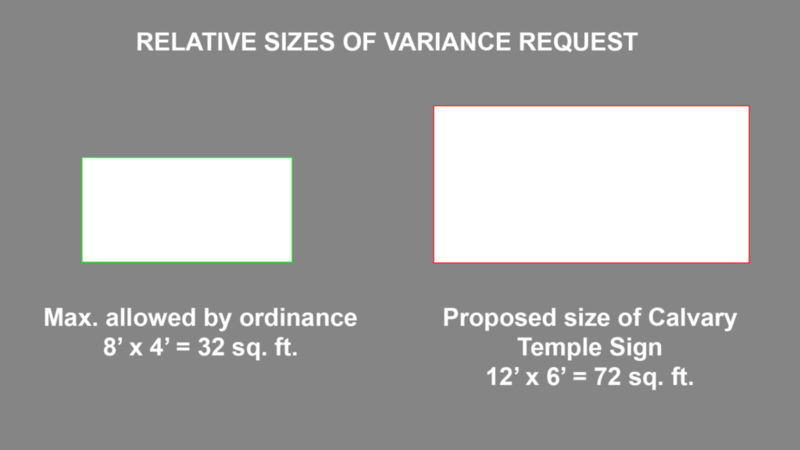 Diagram of relative sizes of the maximum size allowed by ordinance versus the proposed size of the Calvary Temple Sign on Loop 534. More than one commission member stated that they were voting “no” at this time, but that the code review process was in the works, and the sign ordinance may very well change once that process is complete. 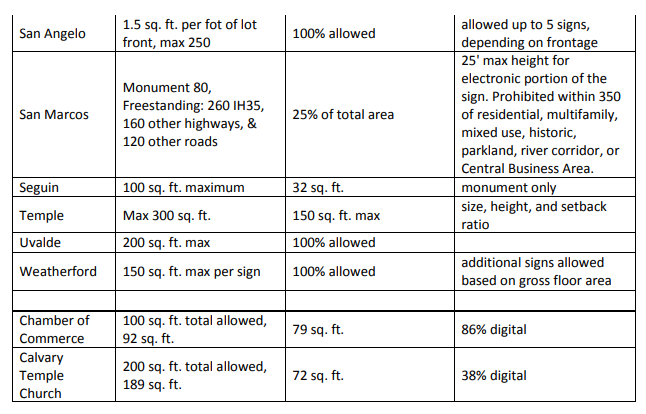 So it is possible that the proposed sign may, in fact, be in compliance with a future amended sign ordinance. Staff reported that the Code Review Committee would be meeting during the next two weeks, and an open house of the proposed revisions would be available to the public on February 25. Following that presentation, a joint P&Z and Council meeting would be scheduled for March 7. This entry was posted in City of Kerrville, Local Issues, News and tagged planning and zoning, sign ordinance on February 12, 2019 by Aaron Yates. The Kerrville City Council will convene on Tuesday evening, February 12, at 6 PM, at City Hall. This week’s agenda includes an affordable housing community, a conditional use permit for HEB, food trucks, establishment of a senior services board, Playhouse 2000, and board appointments. Council will also adjourn to executive session to discuss a proposed Marriot Springhill Suites hotel planned for downtown. On a lighter and more inspirational note, fourth grader Madaline Munoz will receive a Certificate of Recognition for her heroic efforts during a house fire at her home. The Kerrville Fire Department will recognize Madaline for her quick thinking in this emergency situation. Our congratulations go out to this exceptional 10-year-old! 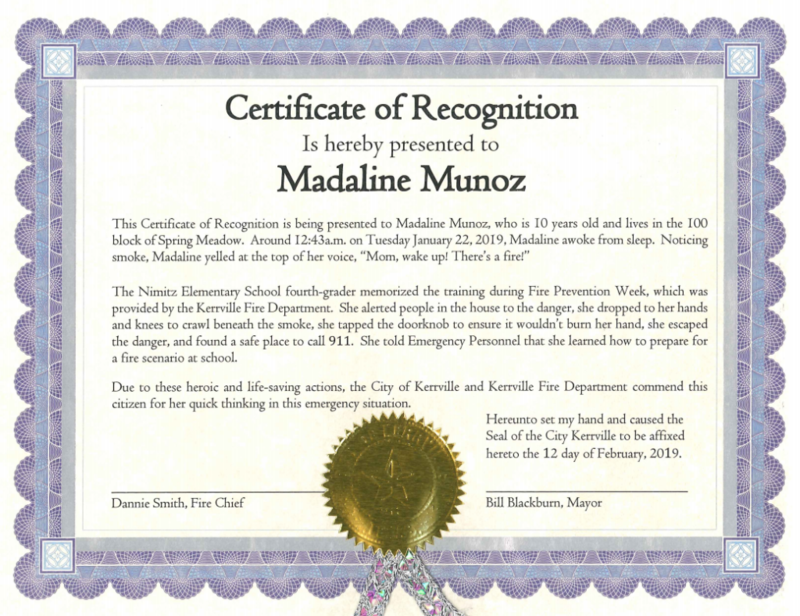 Certificate of Recognition for Madaline Munoz for her heroic and life-saving actions during a fire in her home on January 22, 2019. The city council will consider supporting an application by Hillcrest Senior Village to the Texas Department of Housing and Community Affairs for low income housing tax credits. 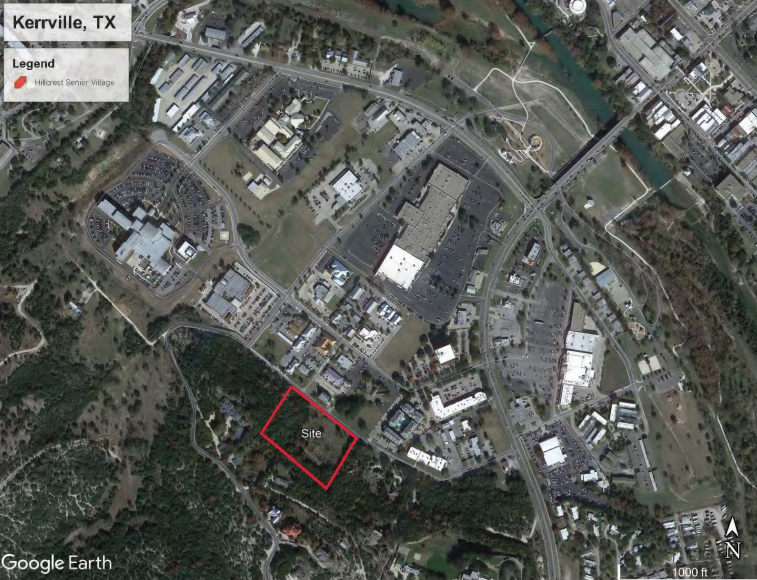 This proposed development will be located on Lehman Drive and will contain approximately 50 units, 40 of which will have restricted rents, and 10 of which will offer standard market rate rents, in order to accommodate the diverse housing needs of mixed–income seniors in the City of Kerrville. If the application is approved, the developer would receive federal funds via the state agency for property tax reductions of about 9%. To be competitive, the applicant must receive a commitment of a financial contribution to the project by the City of Kerrville in an amount of at least $250 in the form of a loan, grant, or reduced fees. Once submitted to the state, the application would be approved by July 2019. HEB’s plans for a new store also include a new set of gas pumps and a car wash near the northwest corner of their property. Although there is already a gas station on this property, the new plans include relocating the pumps and adding more pumps, as well as a car wash, and this action requires a Conditional Use Permit, or CUP. Council will hold a public hearing and consider granting this CUP, which has been recommended for approval by staff. Proposed HEB store along Main Street in Kerrville. Health, Sanitation, and Food Trucks? Kerrville wants to modernize its Health and Sanitation Code by adopting the Texas Food Establishment Rules — a set of state regulations that Texas adopted in 2015. In addition to simplifying food establishment rules, this adoption would also update the Mobile Food Unit section of the city’s ordinances. The city has met with various food truck vendors to review this ordinance, and the city’s Food Service Advisory Board recommends the ordinance for adoption. Stock photo of a food truck. Could food trucks become more feasible in Kerrville? Variance process for the requirements of a Central Preparation Facility — Currently, all food trucks must have a permitted kitchen or other facility to prepare food and dispose of waste, making it difficult to operate a food truck unless the vendor also has a storefront or catering facility somewhere. This ordinance could lift that requirement on a case by case basis. Fire safety requirement — The Code Review process is ongoing, but this ordinance would allow vendors to comply with all fire codes until the code review is complete. Lowering fees — The annual permit fee would be reduced. Council will consider changing the membership of the board to 16 members (up from 13 members). Each member of this board must be at least 55 years of age or have experience in senior service, and must reside within the city limits. The Cailloux Theater (officially known as the Kathleen C. Cailloux City Center for the Performing Arts) was renovated in the early 2000s, but even before that renovation, the Playhouse 2000 organization operated the theater and coordinated the performances that take place in that exceptional venue. Since that original agreement that was created almost 20 years ago, the city and the Playhouse 2000 organization have negotiated updates for a new agreement, clarifying operating practices and maintenance responsibilities. The city’s expenditure for this agreement is $100,000 for this budget year. Staff recommends approval of this new agreement. Council will consider applying for funding through the EIC for various enhancements to the downtown parking garage at the corner of Water Street and Sidney Baker. The funding would provide maintenance and enhanced aesthetics to the structure. The funding request totals $350,000. City Hall and parking garage in downtown Kerrville. 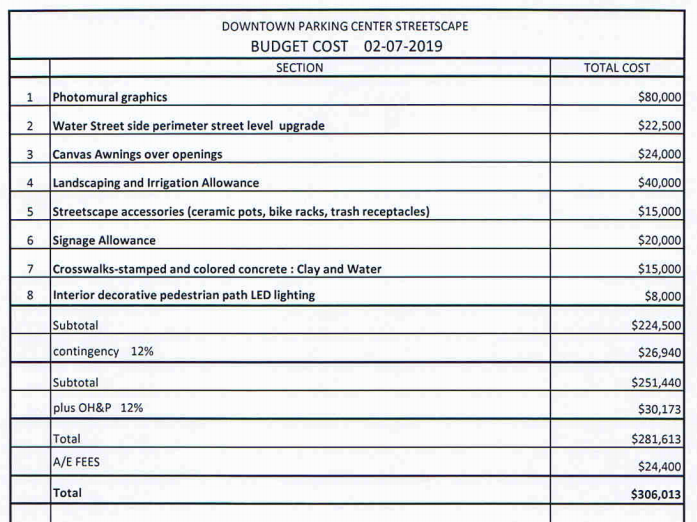 Proposed budget for parking garage enhancements. Council will consider the annexation petition from KISD for the proposed junior high school along Loop 534. 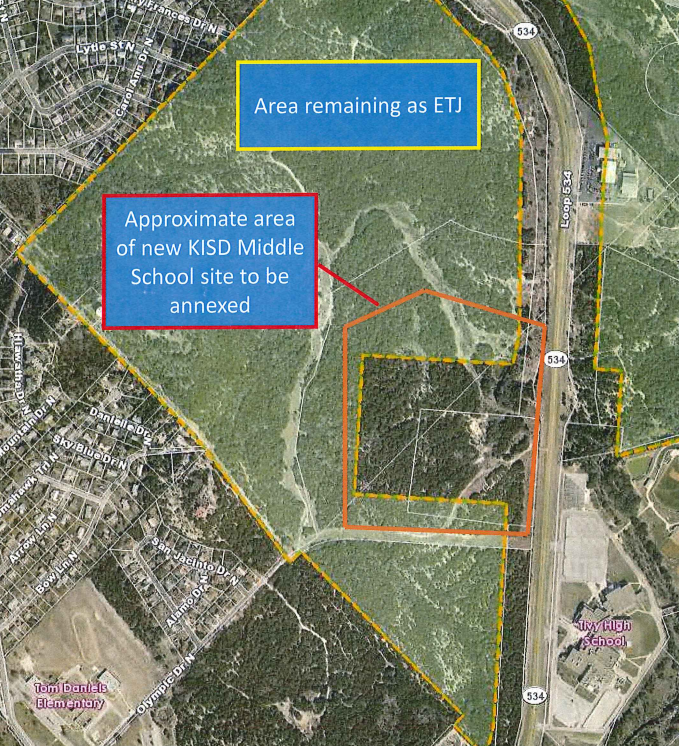 District voters approved a bond issue in November 2018 that included the construction of a new junior high school across from the current Tivy High School on the loop. This annexation request is part of that project, and will be considered several times between now and May 28th, when the annexation would be finalized, if approved. Executive Session: Marriot Hotel in Downtown? 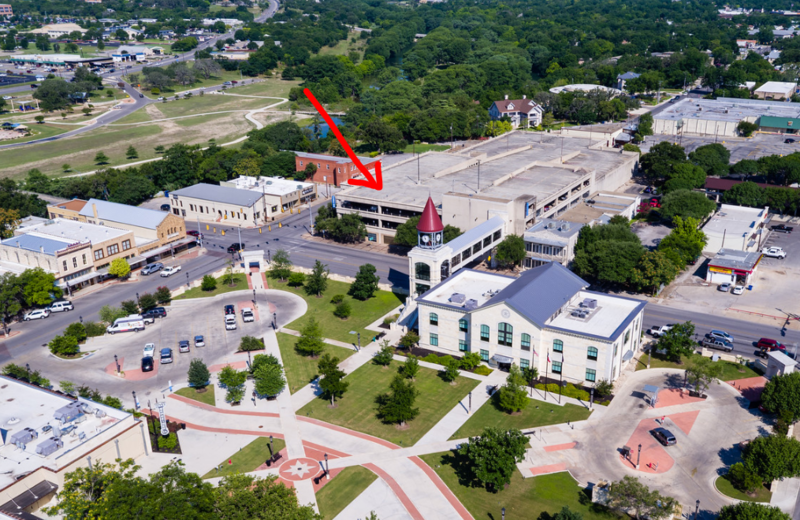 Council will adjourn to executive session to discuss economic development negotiations regarding the construction of a Marriot Springhill Suites hotel along Water and Spring Streets in downtown Kerrville. No information is publicly available regarding this hotel, but rumor has it that the hotel is to be located between One Schreiner Center and the old phone company building — just across the street from the Catholic Church. 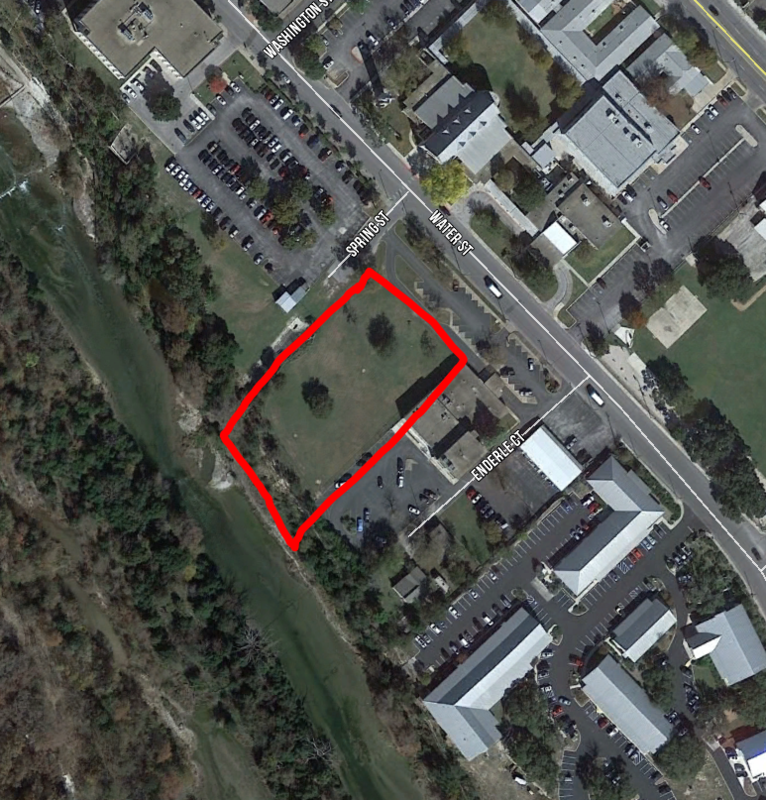 Rumored location of potential Marriot hotel in downtown Kerrville. This entry was posted in City of Kerrville, Local Issues, News and tagged city council on February 12, 2019 by Aaron Yates. Kerrville’s Planning & Zoning Commission will discuss electronic signage during this Thursday’s regularly scheduled meeting at City Hall. Two agenda items relate to the electronic signage issue. The first is a discussion regarding sign ordinance research. The second is a variance request for Calvary Temple Church’s proposed electronic sign on Loop 534. The variance request for the Chamber of Commerce sign has been withdrawn and will not be part of Thursday’s meeting. The full agenda and packet is available to download here (PDF). At the previous P&Z meeting, the commission instructed staff to review the current sign ordinance and collect examples of various sign ordinances from other communities. This research was specific to how other cities treat electronic message displays, digital boards, electronic message centers, or changeable copy signs. 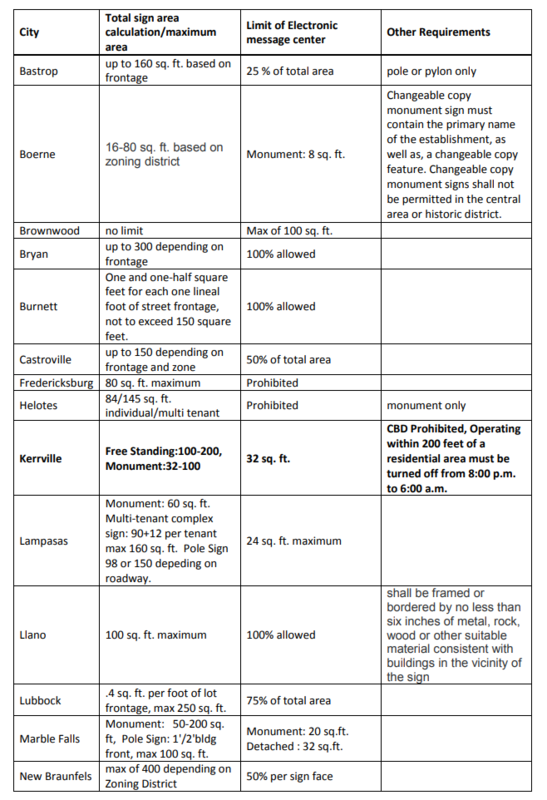 Within the agenda packet prepared for commission members, staff has created a chart displaying sign ordinances from numerous Texas cities as small as Llano and as large as Bryan. Many of these cities regulate a sign’s total area, and then denote a percentage of that total area that can be used for electronic messages. The chart is shown below. Staff recommends that if the commission does want to change the code, that they consider changing our current ordinance to regulate electronic signage as a percentage of the total size of an allowed sign, but also cautions the commission that another committee has already been tasked with the review of the sign code (along with other ordinances) next year. Staff’s opinion states that it might not be prudent to review and update the sign code at this time, knowing that the entire code will be reviewed again in a few months. 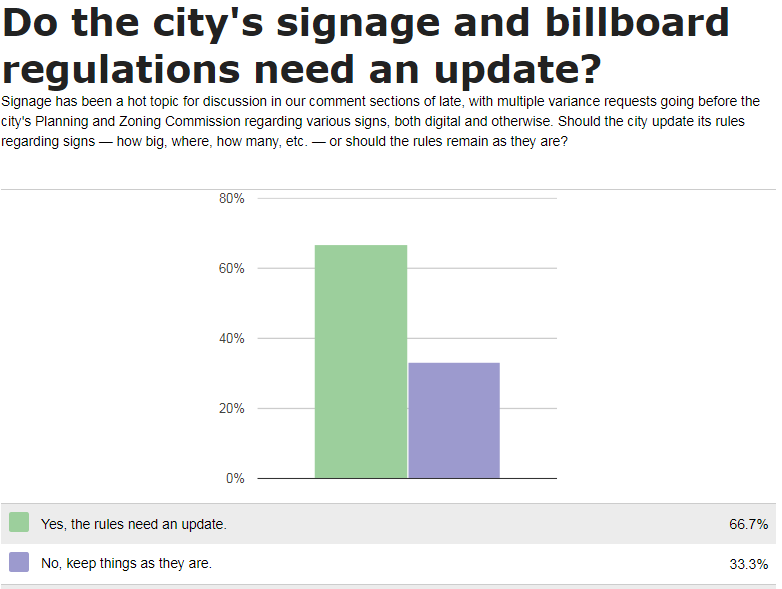 The Kerrville Daily Times offered an online poll on their website asking if the city’s sign and billboard regulations need an update. Although the poll doesn’t indicate the number of responses, the results show that approximately 2/3 of respondents believe the regulations need to be updated. Kerrville Daily Times online poll results as of February 4, 2019. If the P&Z does decide to amend the ordinance, it would not be done at Thursday’s meeting. Staff and City Attorney Mike Hayes would likely draft an ordinance to amend the code, which would be approved at subsequent meetings. Last month a variance request for TEU Services for a sign located at the Chamber of Commerce was pulled from the agenda just hours prior to the meeting. Again this month, the variance request has been withdrawn and may be reapplied for at a later date. So, for now, the sign at the Chamber of Commerce building will continue to be used only in part, so as to conform with the current ordinance. To allow an electronic sign to exceed the maximum size of 32 square feet by allowing an electronic sign that is 12 feet by 6 feet for a total of 72 square feet. Staff traditionally does not make recommendations for or against specific sign variances, and has not made a recommendation in this case. Mock-up of proposed sign at Calvary Temple Church. 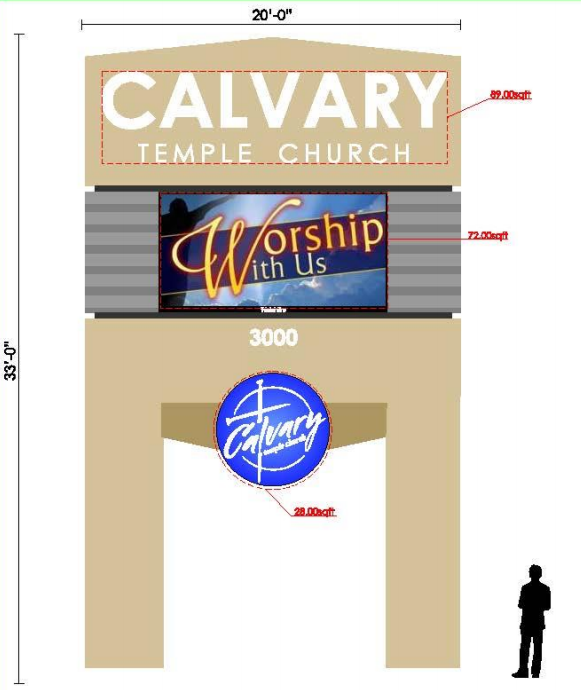 If the variance request is approved, Calvary Temple may begin construction of the sign. The variance does not have to be reviewed by City Council. The meeting is scheduled for 4:30 PM this Thursday, February 7, 2019, and will be held in the Council Chambers at City Hall, 701 Main Street, Kerrville, Texas. The meeting is open to the public. This entry was posted in City of Kerrville, Local Issues, News and tagged planning and zoning, sign ordinance on February 4, 2019 by Aaron Yates.